About 64 per cent polling was recorded in the elections to the 24-member Shimla Municipal Corporation here today amid allegations of rigging by the ruling BJP. 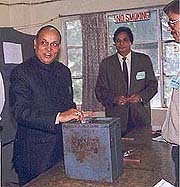 The Chief Minister, Mr P. K. Dhumal, casting his vote for the Shimla Municipal Corporation election at Shimla on Saturday. An action plan to mitigate the problems of nomadic tribesmen of Himachal Pradesh, considered the weakest and most exploited section of hill society, has been prepared by the Integrated Watershed Development Project. At least 69 residents of Bandal village in the Daka Palera Panchayat of this district have been taken ill due to gastroenteritis since yesterday evening. Medical teams have been rushed to the village along with the medicines, Health Department sources said here today. The district administration today directed the IPH Health Department to clean and chlorinate the traditional drinking water sources like wells and “bowris” in Kangra district as part of the arrangements to tackle drought-like situation in the coming days. The entire belt of Nayagran in the Bharmaur tribal region of the district has been cut off from the rest of the state with the washing away of the Choli bridge on the Chamba-Nayagran highway due to an unprecedented deluge in the Choli nalluh following heavy downpour early this week, according to delayed reports received at the district headquarters town of Chamba. Mr Sat Pal Thakur, President of the district unit of the Himachal Pradesh Non-Gazetted Employees Federation, has asked the district administration to take action as the government employees’ residential colony at Hardaspura in Chamba town is stinking owing to unhygienic conditions. The District and Sessions Judge, Mr M.D. Sharma, here today sentenced Kamaljeet of Nawanshahr to 10 years’ rigorous imprisonment and fined him Rs 27,000 for being involved in a daylight bank dacoity on January 5, last year. With the launching of the Kangra pilgrimage.com site on the Internet, thousands of devotees sitting at their homes in any corner of the world can be part of the prayers at the Chamunda and Brajeshwari temples. 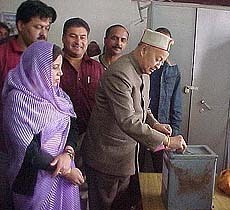 The CLP leader and former Chief Minister, Mr Virbhadra Singh, casts his vote at Shimla on Saturday. Also seen in the picture is his wife, Mrs Pratibha Singh. 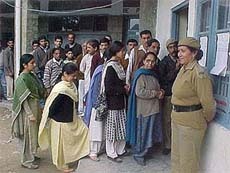 Voters queue up at a polling booth. About 64 per cent polling was recorded in the elections to the 24-member Shimla Municipal Corporation (SMC) here today amid allegations of rigging by the ruling BJP. Barring some stray incidents of alleged irregularities, the elections passed off peacefully. The Congress and the nine-party Him-Loktantrik Morcha made allegations of rigging by the BJP. They alleged that names of several voters were deleted and fictitious persons included in electoral rolls. The heaviest polling was recorded in the Krishnanagar area where 70.4 per cent votes were cast and the lowest turnout was on the Mall in the heart of the town where 52.6 per cent electorate exercised its franchise. There was heavy polling in the wards of Sanjauli and Summer Hill areas although many people had gone out because of holiday for three days. Rebels of the Congress are pitched against party candidates in all three wards of Sanjauli. About 25 per cent people had cast their votes by noon. It picked up later and about 60 per cent votes were cast by 3 p.m. About 59.7 per cent polling was recorded at Sankli, 70 per cent at Tutikandi, 67.6 per cent at Annandale, 64.7 per cent at Kanlog, 65.4 per cent at Bharari, 67 per cent at Kaithu, 59 per cent at Comli Bank, 64.8 per cent at Boiluganj, 62 per cent at Nabha, 66 per cent at Phagli, 61.7 per cent at Ram Bazar, 52.6 per cent at Lower Bazar, 65 per cent at Sabzi Mandi, 61 per cent at Lakkar Bazar, 65.6 per cent at Jakhu, 56.5 per cent at Benmore, 63.7 per cent at Khelini, 67.6 per cent at Chhota Shimla (east), 62 per cent at Chhota Shimla (west) and 63, 63.8 and 58 per cent in the wards of Sanjauli. As many as 119 candidates are contesting the elections. The BJP and the Congress have fielded their candidates from all 24 seats while the HVC is contesting 22 and the Him-Loktantrik Morcha 21 seats. The counting of votes will begin at 8 a.m. on Monday. Reports of minor brawls between supporters of different candidates were received from Sanjauli and Summer Hill. The Deputy Commissioner and returning officer, Mr P.C. Katoch, said no untoward incident had been reported. Senior leaders of the ruling BJP, Congress, Him-Loktantrik Morcha and HVC went around supervising the polling. The CLP leader, Mr Virbhadra Singh, the PCC chief, Mrs Vidya Stokes and a former Chief Minister Thakur Ram Lal visited various areas. Mr Virbhadra Singh denied that he went to the residence of a former Deputy Mayor in the Sanjauli area on Thursday to campaign for the rebel candidates. He clarified that he had gone there in connection with a puja that was organised by the former councillor and had nothing to do with the rebels. Some prominent residents of the town complained that their names had been deleted from the rolls. Mr Kaul Singh, MLA and convener of the Congress SMC election committee, alleged that polling officials in certain places allowed “fictitious” casting of votes in favour of the BJP. Cases of impersonation were not registered although such incidents were brought to the notice of the police, he said. He alleged that the Chief Minister, Prof P.K. Dhumal, had violated the model code by visiting various areas last evening to campaign for his candidates although the campaign had officially come to a close on April 25. An action plan to mitigate the problems of nomadic tribesmen of Himachal Pradesh, considered the weakest and most exploited section of hill society, has been prepared by the Integrated Watershed Development Project (IWDP). Aimed at reorganising these key partners of hill economy who share resources with the local population, the plan envisages improving their livelihood. Himachal’s Principal Chief Conservator of Forests, Mr R A Singh, throwing light on the plan, stated that a special component had been prepared to address the problems of the migrants in the state relating to livestock and their diseases. The thrust of the plan is to ensure that there was no conflict among the nomads and the locals in the sharing of resources. He stated that the Gujjars residing in Sirmaur district and at Nurpur who comprise a major chunk of migrant population, were leading a settled life comparatively. It is proposed to register them in village development committees (VDC) to facilitate their participation in proceedings. The nomination of a representative from a tribal development committee will also be made to a VDC. A district-level coordination committee is already working in five districts of the project to monitor the progress and interests of the tribal nomadic population. Several problems are being faced by these tribesmen, the foremost being lack of fodder in the area allotted . This shortage compels them to make payments in cash and kind to panchayats as well as individuals. The overall availability of fodder has been shrinking due to incidence of lantana and ageratum weeds on their land. Buffalo grazers are reported to migrate to the project area during the rainy season affecting the supply of fodder to migrating shepherds in winter. Veterinary treatment is also difficult to obtain during migration. The plight is aggravated due to the fact that transportation of diseased animals is not allowed in public transport. The non-availability of shearing machines as well as drinking water for animals en route is another problem faced by them. Many shepherds are not aware of the facilities and many a time they do not know of the procurement dates in the area. Owing to poor feeding and indigenous breeds of animals, milk, wool and meat yields are low. Prices are also reported to be unremunerative. The action plan prepared by the IWDP proposes to mitigate these problems. The introduction of nutritious, high-yielding grass and fodder can address the problem of low productivity to a great extent. In addition, there is need to increase the area under fodder. Certain species of bushes and trees, if planted, can help ease the situation. Preference for species, liked by animals, would go a long way in promoting the welfare of shepherds and other nomads. The size of the herd needs to be reduced by phasing out unproductive animals and having fewer but genetically better stock, an activity which the project supports. To improve the breeding of livestock, particularly buffalo and sheep, project officials suggest steps. Stress will also be given to encourage shepherds to make use of natural breeding centres available in village development committees. In order to improve the productivity of milk and wool, a provision of supplying mineral mixture is also inbuilt in the project and this facility would be extended to nomads. In addition to this awareness generation by way of livestock shows and camps, it proposes to provide reading and other publicity material. Animals being the backbone of the nomad economy, the project proposes to generate an awareness in nomads by imparting training to make them technically aware so that they enhance the value to their produce in addition to processing of milk, income generation through manufacture and sale of blankets, woollen clothes, etc. The plan will be monitored at each level to achieve its motive. Dr J.D. Mehta, Chief Medical Officer, said the report of the outbreak of the disease was received yesterday and the medical teams headed by a Block Medical Officer, Dr V.K. Mahajan, were immediately rushed to the village. Dr V.K. Mahajan, BMO, when contacted said 59 cases had been treated since yesterday in the village and door to door medicines were distributed among the ailing patients. He said Bandal village having population of nearly 450 persons had only one natural source of drinking water which had got contaminated. He said chloroine tablets were distributed among the villagers. Mr Rattan Jagatamba, Kangra Zila Parishad Chief, after visiting the village said today that villagers were forced to take contaminated bowri water which resulted in the outbreak. He urged the villagers to maintain cleanliness around bowri to avoid such outbreaks. The Deputy Commissioner, Mr Prabodh Saxena, today held a meeting with the IPH, Health, Forest and other departments to make all arrangements to tackle the situation arising out of the dry spell in the summers. He asked the IPH Department to regulate drinking water supply. He asked the Health authorities to take water samples from these traditional water sources to ensure that they are not contaminated and make them fit for human consumption. He assured that if the need arose water tankers would be pressed into service. Mr Saxena asked the Forest Department to constitute fire fighting squads and keep fire tendering engines ready in case of forest fires. The administration also asked the block medical officers to ban the sale of over-ripe fruits and vegetables as a precautionary measure. link to residents of tribal terrains falling in Nayagran rift valley. Meanwhile, Mr Thakur Singh, a former legislator of Bharmaur, has demanded that the state government should reconstruct the bridge as early as possible. Mr Thakur said here today that there was only one safari karamchari to look after the sanitation of the entire colony. He expressed apprehension that the lack of cleanliness in the colony precincts could lead to diseases. Mr Thakur demanded the deployment of more safari karamcharis in the colony. Kamaljeet and Jasvinder Singh had looted Rs 54,504 from the State Bank of India branch at Swahan near here and Rs 10,000 from a customer, Bachnaram at gunpoint. The District Attorney Baghuram Mastana, who conducted this case, said Jasvinder Singh has been on the run since the crime took place and declared a proclaimed offender. “Since I hold keen interest in Indian culture and tradition, a friend of mine suggested the site to me and I must congratulate the authorities for the nice layout and mantras in audio format,” Tom Edward, an Australian, said. Many such congratulatory notes are pouring in from India and abroad after the launch of the site, which offers information about religious shrines, annual Hindu calendar, fasts, festivals, Navratras etc. The site contains detailed information about the profile, history, location and travel tips to Jwalamukhi, Brijeshwari, Chamunda, Masroor, Baijnath, Kunal Pathri, Bhagsu Nag, Gupt Ganga, Chinmaya Tapovan, Baba Baroh, Durgeshwar Mahadev and Aghanjar Mahadev temples. Ashapuri and Baglamukhi temples will soon be added to the list. “A lot of research work was done about the religious places and shrines of Kangra district prior to the launching of the site, which I feel will help in bringing these places on the international tourist map through the Internet,” the Deputy Commissioner, Mr Prabodh Saxena, said. The tourist places featured in the website include Kangra Art Museum, Martyr’s Memorial, Triund, Kareri, Dal Lake, Naddi Dharamkot, McLeodganj, Bhagsu Nag waterfall, St John’s Church, Kangra and Nurpur Forts, Pong Dam, Bir-Billing, Gopalpur Zoo and Andretta Art Gallery.